← Investment Mindset Bootcamp. Stop Gambling. Start Accumulating Long Term Wealth. Step 5. In my view this is a very unusual time for investors as I have tried to lay out in my notes over the quarter. Markets have been subject to extremes and have become polarized along lines of investor type and mindset. 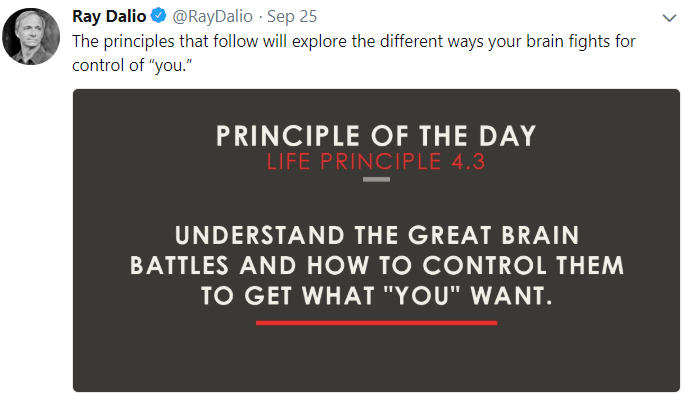 It is important to reflect on your own thinking if you are going to understand the current reality, and understand very different perspectives. I have created a series of articles I call the “Investment Mindset Bootcamp”, as I believe it has never been more important to be clear about what you are doing, how and why. positioning in big cap US equities. Speculators have record long positions, while commercials have record short positions. History shows it rarely pays to ignore the commercials in any asset class including US equities. Market leadership has been narrowing and uniquely driven by a few big cap stocks. The chart below shows that while the S&P 500 and Dow Jones are near new all time highs there are more new lows than new highs. The chart below shows the record clearly of what has happened before when the market behaves like this. 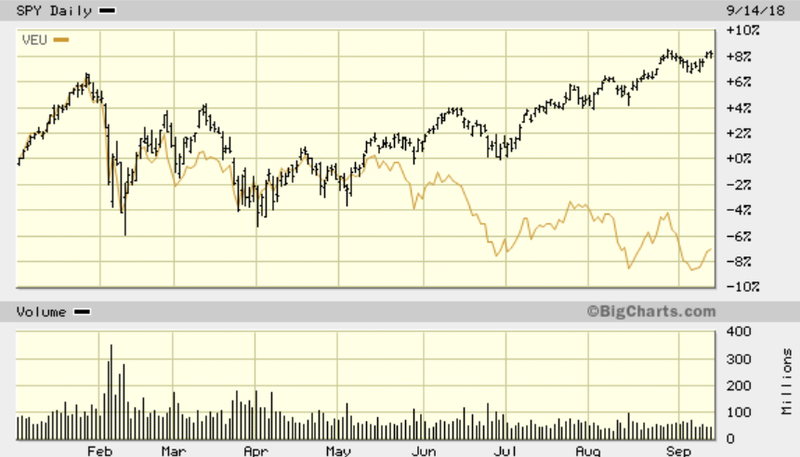 The rally in US equities has begun to show key divergences not seen since the highs in 2007. In S&P 500 momentum, and in key sectors like real estate and bank index. In each of the 4 charts below it shows new highs in the underlying security, but at the same time with declining momentum. This pattern closely matches the highs in 2007. I recently wrote about 10 extremes in markets, like the divergence between US and non-US equity markets; which I believe is very key to assessing the investability, dynamics and risk at the current time. 10 extremes is sufficiently high to start being concerned about risk levels. 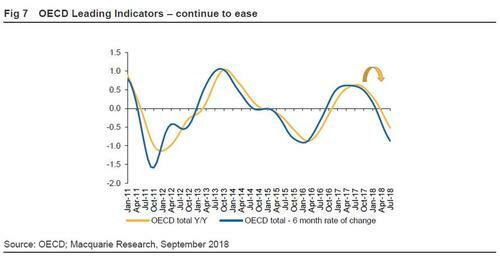 It is important to realize that a globally slowing economy, combined with continued tightening policy by the Federal Reserve is an increasingly challenging investment environment. It is clear from the charts below that global growth is slowing and most global equity markets are in down trends. 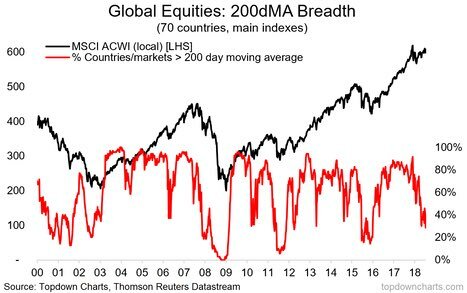 While the US is holding up the ACWI only 30% of country equity markets are above the 200 day moving average. As the charts above show, the global economy and equity markets went into a downturn even before the beginning of this year. However, the US set off yet another debt stimulus through the tax reform bill, and it’s now clear who benefited most, corporations. How was most of the cash used from this massive corporate windfall? Why so many buybacks? As executives cash out at the highest valuations in history? A good part of the corporate windfall from the tax reform bill is being transferred into executive equity compensation. 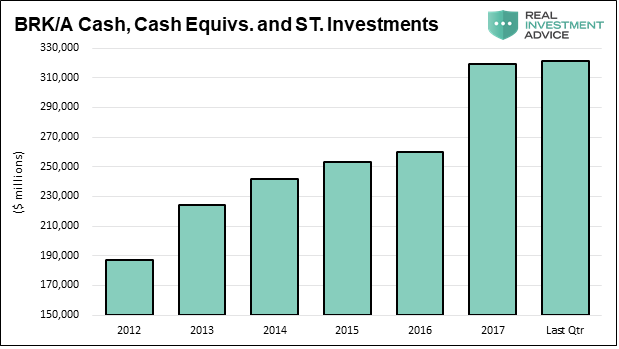 The link above shows that buybacks this year far exceed capital spending. At record valuations it is hard to argue the case for the corporate investment merits of all these buybacks. 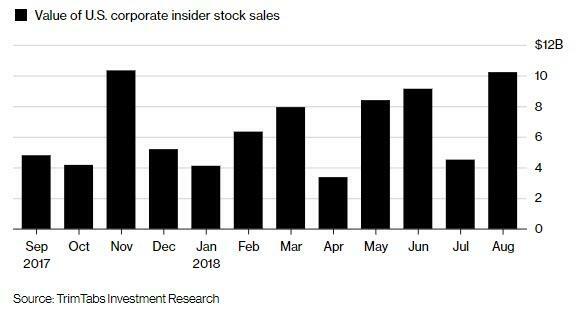 The extreme insider sales certainly make a statement in this regard! It is crucial that investors understand that this all stems from debt, and how dominant debt has become. The attribution analysis makes it clear what has been driving markets, at an accelerating rate since 2008. Debt. Look at the chart above until you understand what it means! If your still not sure read the comments below from one of the all time great investors, Stan Druckenmiller. My stated objective is to maximise gains over a full economic cycle. This is because only through a full cycle is any strategy fully tested and because the major turning points in markets and economies are cycle based. There is not much that’s more important in investing than measuring and mapping the cycle! Now the most important component of the cycle is the debt cycle. The chart below shows the full history of how debt and GDP have interacted since the US went off the gold standard starting in 1968. With debt increasingly unconstrained by gold, it should be no surprise that debt has grown exponentially since 1968, as shown many times in previous notes, and by the red ink in the chart above. Of key importance is to notice that debt and GDP have different and opposite relationships over short and long term time horizons. The long term relationship is the clearest. 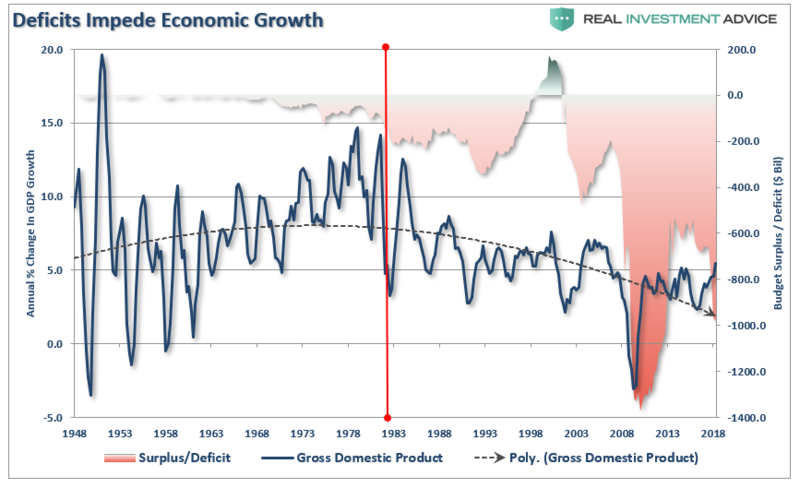 Once debt reached a certain critical mass by 1978, growth in debt has coincided with consistently lower highs in GDP growth and a persistent decline in long term growth, shown by the dotted line for the last 40 years. Long term, debt is bad for growth at an accelerating rate! The shorter term relationship, which requires a closer look, shows the opposite relationship. 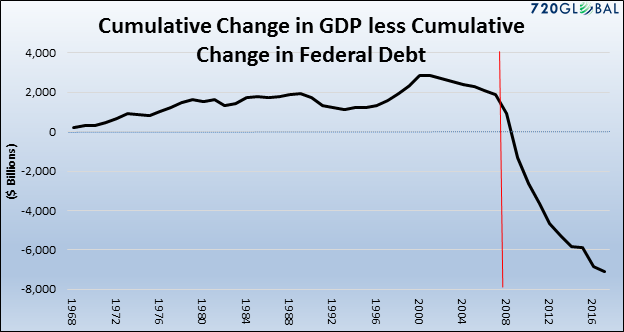 Within an overall declining trend in both debt and GDP growth, from the early 1990s until Trump was elected at the end of 2016, there is an observable correlation between rising debt growth following falling GDP growth with a short lag. Debt is like sugar. You get a great short term boost, but if you keep at it, it becomes a problem. Where is debt going now? “Without much fanfare or public discussion, Congress has decided to push the U.S. into deeper fiscal responsibility. Earlier this week, the House passed another Continuing Resolution (CR) to keep the government from “shutting down” prior to the mid-term elections. For almost a decade, Congress has failed to pass, and operate, underneath a budget. Of course, without any repercussions from voters in demanding that Congress “does their job,” the path to fiscal insolvency continues to grow. It’s always worth checking in with the the best cycle managers over recent decades and what they are doing or saying. While retail investors are expressing extreme optimism, here we see the polar opposite, with surprising consistency. Here is a diagram of cash in Warren Buffet’s Berkshire Hathaway. Consistently increasing to what must be close to maximum caution. Strategy, as outlined in the investment mindset bootcamp articles, is always focused on minimizing risk and maximizing return to risk. The main approach for maximizing returns over the full economic cycle, have been developed mainly from the track record of strategies shown with backtests with over 40 years of data shown in step 5 of the boot camp series. Central to these strategies are the allocations to Stocks, Bonds and Gold. Many other sectors play a significant part but these are central. Although, I rarely position directly in currencies, I would also say that the strength of the US dollar, broadly defined, is also important. The key perspective for strategy starts with the world economy, which is now clearly in a downtrend. As shown above global equity markets have been confirming this since the beginning of 2018. There is still no sign of this turning around so at the highest macro level this sets an ongoing and clear note of caution. Federal reserve policy remains on a tighten path, for the US and to some degree for the world too. It is important to realize that declining growth and tightening policy is typically a hostile investment environment. The US has been an outlier in this global cycle, due to its remarkable pro cyclical fiscal stimulus, which particularly benefited the corporate sector. 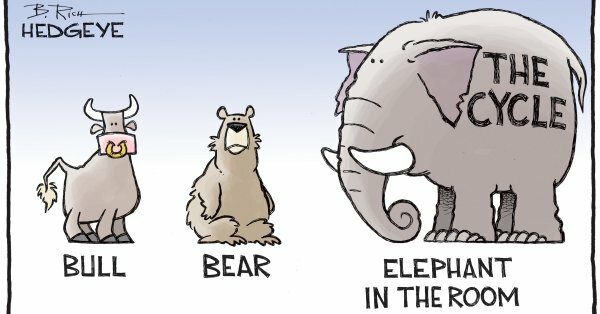 For all the reasons and analysis discussed above the most likely cyclical outlook is that most of the stimulus is reflected in the markets already and unless even more extraordinary steps are taken, the debt to GDP pattern described above would reassert itself at some stage, and possibly soon. For this reason, there was a significant probability that after a record 8 quarters of accelerating growth in US GDP, this would soon soften. Until the end of August it seemed that the markets were beginning to confirm a quad 4 (inflation and growth starting to decline) scenario for the US. The CPI confirmed a peak in the YOY rate, and the most accurate GDP tracker I follow was also on target for the first decline in YOY GDP growth for 2 years. Long term Treasuries, TLT, showed the strongest relative strength on my measures, and the correlation with the US dollar, UUP, which is a clear quad 4 signal, broke out to new highs on the upside. At the margin I shifted into longer term Treasuries and equity bond proxies Utilities and REITs in the models, over this period. In September these new trends all reversed. The GDP data strengthened and debt was expanded again as described above. As a result, I reduced much of the Quad 4 positioning. The outlook remains the same, timing economic shifts is more process than a single point, and the concept is most likely delayed rather than altered. However, the markets now need to reconfirm this outlook. A key element of investing is knowing when the risks are paying off and when they are not. Although, it is always worth taking some level of risk, otherwise you are not testing the market, there are times when risk should be kept very low, until conditions improve. For me I believe a low risk profile was the best approach in Q3 2018, and remains so. The US is at odds with the world economy and potentially at a key turning point, with multiple extremes and distortions present. The morningstar Broad Hedge Fund index for hedge funds seems to confirm my point of view, down 1.38 in the first two months of Q3 2018. 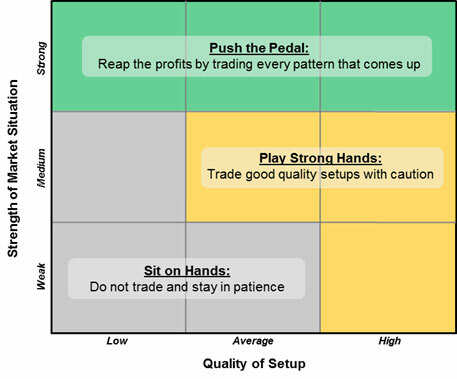 The article in the link above shows the diagram below of how to vary commitment size in different market conditions. Today I believe investors need to decide whether to be aligned with speculators and retail investors or commercials and the best cycle investors of our times. The difference has rarely been so extreme and clearly divided. 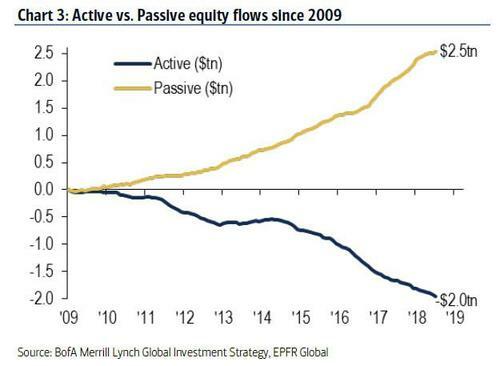 In my experience I have never seen so much conviction in passive investing, and this is happening at all time valuation highs, with the world economy in a clear downtrend for nearly a year. I hope that retail investors understand the key dynamics between debt, cycles, and the markets. As described above it is unlikely to stay stable in perpetuity, and the unwind of so called passive investors could contribute to sizeable mean reversion. As discussed above execution of strategy keys off the core focus on the 3 main asset sectors, equities, bonds, and precious metals. 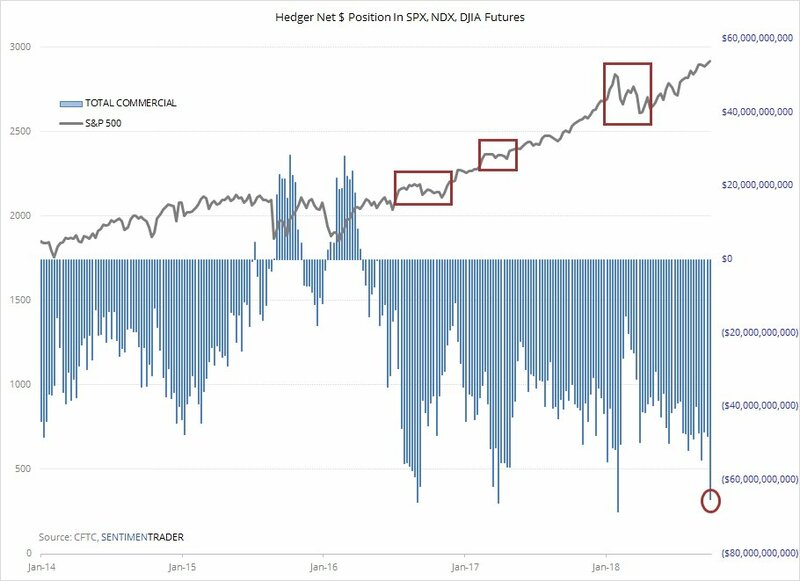 The first chart in this note showed the record commercial short position in equities, largely offset by speculator longs. 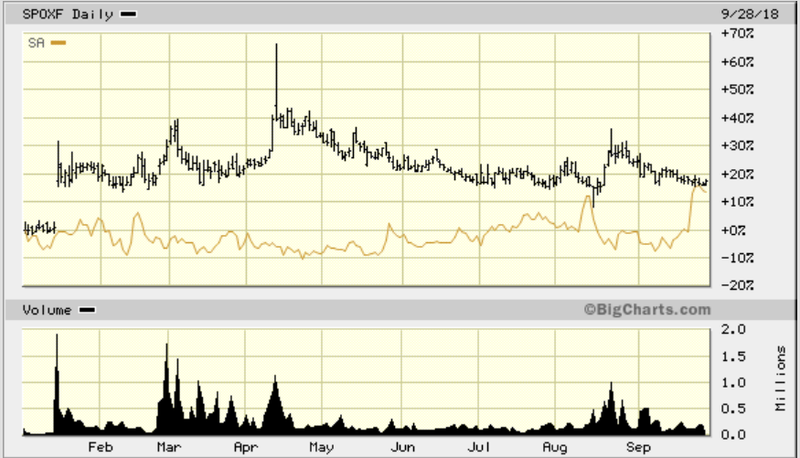 The chart below shows a similar extreme by speculators. 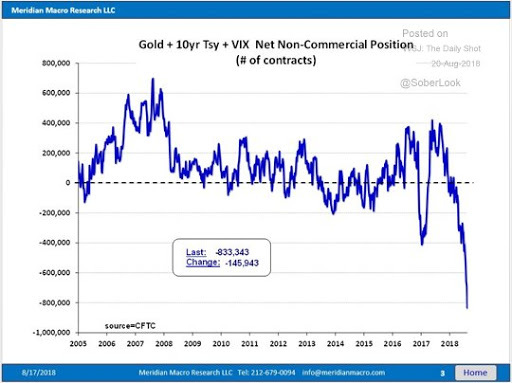 This time speculators are short, to an historical extreme, of all safe haven assets, as represented by gold, bonds, and S&P 500 options contracts! Speculators have never been more confident about equities relative to gold, bonds and equity hedges. Apparently, in the view of speculators, risk management across all three main sectors equities, bonds and gold, has never been more unattractive. It seems that either risk management has become obsolete, or it has never been more underrated and undervalued. As shown in the examples in the Investment Mindset Bootcamp, step 5, the classic 40 year plus models are based on 25% plus allocations to gold, and even higher allocations to bonds. So Q3 2018 was a significant test of my approach. Fortunately, as discussed above a very low risk approach had already been adopted so to a great extent the damage was limited. Furthermore, if these extremes represent a turnaround point this approach will be ideally suited to jumping on a record opportunity as the cycles revert, possibly soon according to the cycles sages above. At first glance, the chart below showing the relative performance of the Russell 2000 versus the Dow Jones, over Q3 2018, appears to be a puzzle. The Dow Jones is clearly more closely linked to the underperforming global equity markets than the Russell 2000 which is more linked to the outperforming domestic US economy. Yet the performance has moved in the opposite direction in Q3 2018. The buyback phenomena most likely explains the gap. 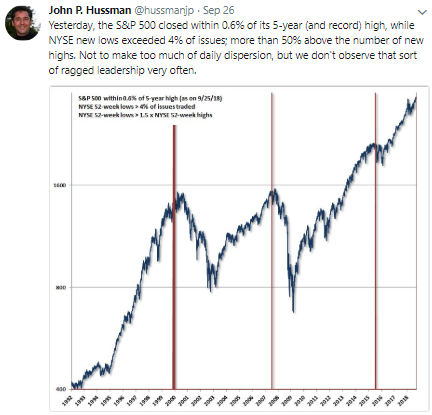 The big caps are where the buybacks are concentrated as the above John Hussman chart shows. Smaller caps stocks don’t have the same balance sheet strength. The discrepancy is clear in the chart below, where there is considerable divergence between the big cap Dow Jones, DIA and the small cap, Russell 2000, IWM. This is most likely testimony to how distorted the markets have become as a result of buybacks. The 3 main equity models, are now partially hedged by equity indexes to manage risk. This has transformed risk and return to risk on these models. Now individual equity selection relative to indexes is a bigger factor, and market risk is reduced. The chart above shows how important it is to select the best index to use as a hedge. 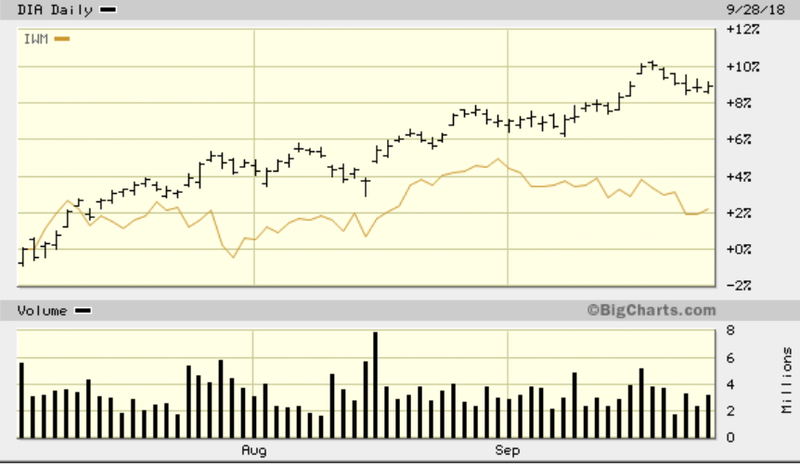 Over the quarter, I reduced S&P 500 and Dow Jones hedges in favor of the Russell 2000. It has now been several quarters since I have considered investing in international equities. The cycle down trend continues to progress, and it remains too soon to consider an uptrend cycle, based on both market and economic considerations. There is little to add to the chart above as regards bonds. The federal reserve has remained on track with its slow, but persistent interest rate rises, and bond yields have continued to slowly rise. At least there are rising low risk yields emerging but bond prices remain in a downtrend so positive total returns have been hard to generate even at short maturities and a widely used benchmark, AGG, has a negative 1.6% return YTD. I did start positioning a little for the increasing likelihood of a Quad 4 outcome as the market started confirming this in July and August. But the emerging trends reversed in September, and I closed positions, and concentrated positions in SHY (1 to 3 year Treasuries) where the yield is attractive and prospective returns are beginning to look more promising with very low risk. Although I believe the long term outlook for precious metals has rarely been better, this year, I have not been optimistic. I reduced most allocations to Precious metals to 7.5% in my core 7 model aggregate. Then within the model we were never fully invested, and cut positions in line with risk management signals to below 50% in the model. 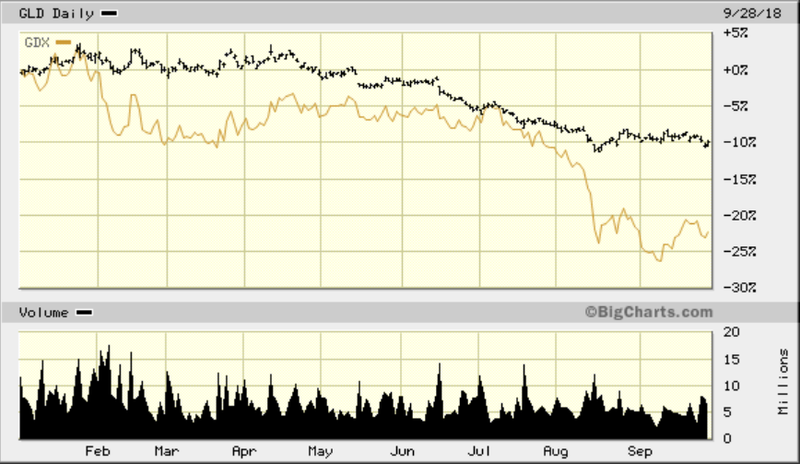 The chart below shows the poor performance this year from both gold, GLD, and gold miners, GDX. Furthermore, silver, Platinum, and palladium are even more volatile. Nevertheless, there have been some bright spots in these sectors, despite the severe precious metals bear market. My short term caution on precious metals relates to my concern about continued tightening of policy, a strong dollar, and the inability of long term treasuries to maintain an uptrend. A treasury rally often precedes a gold rally as the economy moves through the cycle. This is getting closer, but not quite there yet. Nevertheless, when a rally in precious metals from these levels does happen, with this extreme level of shorts, and record global debt. It has enormous potential. 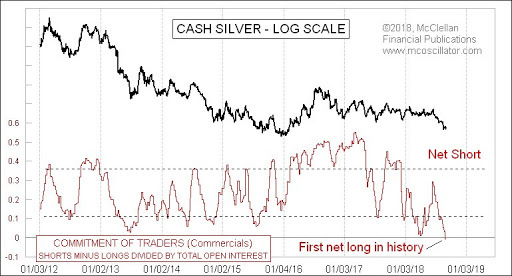 The chart below shows that commercials are now net long of silver, for the first time in history. In my opinion declining global growth and tightening policy is typically a hostile investment environment. In 2018 so far most of the world’s equity investment benchmarks are down year to date in dollar terms. Bonds, commodities, precious metals, international equities, are broadly negative. The outlier is US equities, with outstanding circumstances in debt growth and buybacks the main feature. US markets are reflecting multiple historical extremes, most significantly in positioning. Retail investors have never been more committed to passive investing with an extreme bias in favor of US equities relative to bonds and precious metals. Seasoned Cycle investors and “commercial” futures investors with the best long term track records are broadly expressing the polar opposite position. Fundamentally, the difference is in mindset, and then the investment process that flows from that. At a time of such polarization, investors need to evaluate their own mindset.